The Henry Draper (HD) Catalogue, named for the first photographer of stellar spectra, is a nine volume publication (released from 1918 through 1924) that contains the positions, though not accurate, and stellar spectra for most stars down to about 8th magnitude. This catalog is most often used at present for its valuable spectral information, which Annie Jump Cannon classified for an impressive 225,300 stars. 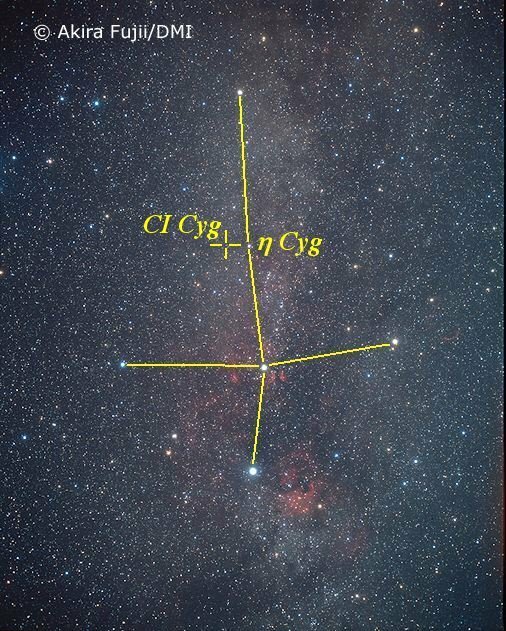 Like many variable stars, CI Cygni was discovered in the early 1900s, in an era of a virtual variable star awakening when the differing classes of such stars were yet to be established. Evidence of CI Cyg's variable behavior was first recognized by Annie Jump Cannon in 1922 when examining Harvard spectrum plates during her work with the Henry Draper Catalogue. The star, which revealed a peculiar spectrum combining two distinct types of spectra, could not be classified with any of the known types of the time. The unusual object was announced to the astronomical world by Harlow Shapley in 1922, whereby he noted a similarity to the spectral characteristics of recurrent nova RS Ophiuchi (Shapley 1922). Further investigation into the nature of the star ensued when Cannon examined more than 300 Harvard photographs taken between 1890 and 1922, where it was then categorized as an irregular variable. Still intrigued by the unique characteristics, Naomi Greenstein later analyzed Harvard photographic plates of the variable for the interval of 1890-1936. During her study she noticed that while CI Cyg varied irregularly between photographic magnitudes 12 and 13, there was a periodicity of about 900 days between successive minima. Also of interest, was a remarkable rise in photographic magnitude 12.1 to 10.7 that occurred in 1911 and lasted for about 200 days. Features of the light curves and oddities in spectra led Greenstein to suggest similarities between CI Cyg and another unusual star, Z And (Greenstein 1937). Z And was later classified to be the prototype of the symbiotic class of stars -- a term coined by Paul Merrill in the 1940s to describe the class of stars with cool M-type photospheric absorption lines and very high temperature emission lines -- with CI Cyg as part of the symbiotic family. Maria Mitchell (1818-1889) was one of the most famous American scientists of the 19th century. Among the many awards and honors bestowed upon her, she was the first female professor of astronomy in the United States. Mitchell is pictured here, just left of center, with a few of the many female students she fostered in astronomy. Image: AAVSO archives. Interest in CI Cyg arose again in the 1960s when prompted by CI Cyg's close proximity to Cygnus X-1 and the curiosity enshrouded with its possible association, which has now been refuted. By studying the Maria Mitchell Observatory photographic plates from 1916 to 1967, Dorrit Hoffleit compiled a composite light curve, fitting an 855 day period to its variations, thereby confirming the report by Balfour Whitney of the University of Oklahoma that the light curve of CI Cyg resembled that of an eclipsing binary star with a period of 855 days (Hoffleit 1968), following the ephemeris: JD MIN = 2411902 + 855d.25 E (see, for instance, Mattei 1981 and Mikolajewska 1985). Furthermore, she also noted yet another departure from the mean curve, similar to that found by Greenstein, when a nova-like outburst occurred in May of 1937 and the star reached photographic magnitude 10.2 (Hoffleit 1968). This interesting variable was introduced to the AAVSO by well-known astronomer, AAVSO past president, and good friend to the association, Dorrit Hoffleit. CI Cyg joined the ranks of the AAVSO during its 1971 outburst, when alerted of its activity by long-time member, observer, and past AAVSO president Wayne Lowder who had been observing this object a few years prior to its inclusion in the AAVSO observing program. Since that time, over 250 observers have adopted CI Cyg into their observing regiment and have contributed over 17,000 observations of this variable to the AAVSO International Database! Optical narrowband images of nebulae around symbiotic variables taken with the HST, Nordic Optical Telescope, and the ESO/NTT. Images courtesy of R. Corradi, Isaac Newton Group of Telescope, La Palma, Spain. There are many reasons. First as in all binary systems, they provide direct information about the fundamental parameters involved, such as masses and radii, that are essential to understanding stellar evolution. Second, they interact. Interactions between stars in a binary system are of great interest in astrophysics today, and symbiotics give us an excellent opportunity to study these processes under the very extreme physical conditions found in these systems. Thus, symbiotics tell us about such basic physical processes as: mass loss from red giants, accretion onto compact stars (main sequence stars, white dwarfs, neutron stars) and the evolution of nova-like eruptions in very wide binary systems, and radiative processes in gaseous nebulae. Third, the symbiotics are among the binaries with the longest known periods. Thus, each component has enough time to fulfill its evolutionary destiny before their interaction begins and a symbiotic star is born. The variety of possible combinations giving rise to the symbiotic phenomenon, combined with knowledge of masses and radii of the stars involved, make symbiotics very important for understanding the last stages of stellar evolution. Finally, last but not least, symbiotic stars simply do exist and it is natural that we try to learn as much as possible about them. For instance, according to Kenyon et al. (1991) and references therein, models of the evolution of binary stars suggest that systems like CI Cyg evolve into a common envelope system, such that the red giant core and main sequence star share an extended atmosphere that is ejected by the binary. The next phase is poorly understood, but it is theorized that cataclysmic binaries may be the result. "CI Cyg lies at the brink of a luminous common envelope phase and may provide important information concerning the formation of short period interacting binary systems in the next few decades" (Kenyon et al. 1991). Thus, it is of great importance that observers continue to monitor CI Cyg, other symbiotics, and even other types of variables so that we may have continuous detailed records of various light curves that can be correlated with other types of observational data and theories. The light curve of CI Cygni from 1916-1967 as compiled by Dorrit Hoffleit using Maria Mitchell Observatory plates. Click imgae to enlarge. The light curve of CI Cyg reveals two distinct types of variable behavior: that of an eclipsing binary and that of an eruptive star. Eclipses: According to Whitney, as mentioned above, the eclipses are seen to take place every 855 days. The duration of the events typically last 100 to 200 days, while the amplitude has been seen to vary as little as 0.3 magnitudes to as much as 2.5 magnitudes. During the eclipse, B-V and U-B become redder, suggesting that a late-type star is eclipsing a hotter component (Kenyon 1983). The period and duration of eclipse totality allow astronomers to estimate the radius of the eclipsed object. In this case, it is about 5x1012 cm (Kenyon 1983). The 35-year AAVSO light curve of CI Cygni from 1967 to 2002 as compiled by S. Tania Ruiz using Maria Mitchell Observatory plates and AAVSO data (Ruiz, J. 1992, JAAVSO 21, 101). Click image to enlarge. Eruptions: There have been 5 recorded outbursts in the recorded history of CI Cyg, which were seen in 1911, 1937, 1971, 1973, and 1975. Such events are thought to be the result of increased mass transfer from the giant or by instabilities in the accretion disk itself (Kenyon et al. 1991). It is interesting to note that virtually none of the outbursts have exhibited the same behavior. The most distinctive episode in CI Cyg's observable light curve occurred in the 1970s when a larger outburst followed two smaller outbursts. The activity observed during this era provided astronomers the first opportunity to look at CI Cyg in a different "light." The early phases of the 1975 outburst were observed in the optical and infrared wavelengths, while the later stages of decline were also covered in the ultraviolet (Kenyon et al. 1991). The importance of multiwavelength campaigns is that it gives astronomers an opportunity to investigate a system in a wide range of wavelengths. This is extremely helpful to the theorists trying to piece the physics of the system together. Since the 1970s, CI Cyg has been fairly quiet in terms of outbursts, so it will be interesting to see the behavior of the next potential bout of nova-like activity! The constellation of Cygnus is one of the most recognizable in the sky. Click on the above image for an enlarged view with the approximate location of CI Cyg indicated. Image: Akira Fujii, DMI. Observers perusing through the constellation of Cygnus may wish to stop and take a look at this interesting symbiotic star. Located just over a degree northwest of the 3rd magnitude star Eta Cyg, observers will find that this variable may change in brightness from about 9th to 12th magnitude at its extremes. 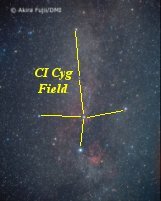 Identification of the CI Cyg field can be made with A-scale charts of chi Cyg, while you should make an E-scale chart of CI Cyg itself to make brightness estimates of the variable throughout its range of variability. CI Cyg, as well as other symbiotic stars, should be observed once a week, with the decimal portion of the Julian Date recorded to one decimal place. For those interested in a more challenging project, observers may choose to look for possible small-magnitude, short-period variability sometimes associated with the symbiotic variables. If you are interested in looking for such features, then be sure to observe every clear night and report the decimal portion of the Julian Date to 4 decimal places. Observations may then be submitted to the AAVSO where they will contribute to the long-term light curve of CI Cyg for present and future generations of astronomers to study and ponder over! Greenstein, N.K. "Light Curves for Three Variables with Peculiar Spectra." Bulletin of the Harvard College Observatory, 906, 1937, 3-6. Hoffleit, D. "CI Cygni and a Similar New Variable Star." The Irish Astronomical Journal, 8, 1968, 149-152. Kenyon, S.J., N.A. Oliversen, J. Mikolajewska, and M. Mikolajewski, R.E. Stencel, M.R. Garcia, and C.M. Anderson. "On the Nature of the Symbiotic Binary CI Cygni." The Astrophysical Journal, 101, 1991, 637-654. Kenyon, S.J. The Collected History of the Symbiotic Stars. Urbana: University of Illinois, Department of Astronomy, 1983. Mattei, J.A. "The Symbiotic Star CI Cygni." Journal of the AAVSO, 10, 1981, 92-95. Mikolajewska, J. "On the Nature of CI Cygni." Acta Astromica, 35, 1985, 65-94. Mikolajewska, J. "Symbiotic Variable Stars." In Percy, J.R., J.A. Mattei, and C. Sterken eds., Variable Star Research: An International Perspective. New York: Cambridge UP, 1992, 267-278. Shapley, H., Harvard College Observatory Bulletin, 778, 1922.